2. Even better, we get to see more of the world of the mice. We meet the hares and see the relationship with the mice. We see a city that used to be occupied by the ferrets, (we haven' Everything I liked about the first book is continued here, with two added elements besides. Opasnost raste, niko nije siguran. Cak je i vreme protiv svih. Prica se fino nastavlja i ovog puta imamo dogadjaje koji nisu bili ociti. Crtez je i dalje predivan i jako mi se svidja lokacije misijih gradova i kako je fino ukomponovano ponasanje pravih zivuljki. 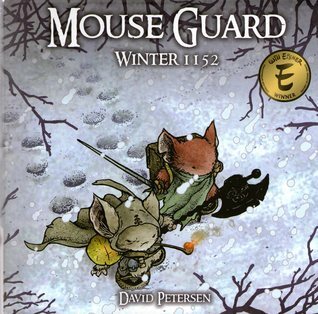 In Winter 1152, David Petersen continues his tale of mouse intrigue, glory, and honour apace. Rather than having the squashed rebellion of Fall 1152 simply fade into memory as a one-off plot to give the first volume some heft, we see that these things have lasting consequences and that the flames that leapt up in open rebellion still smoulder in traitorous saboutage. 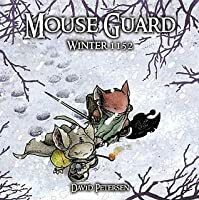 This volumes lays more foundation for upcoming books as Petersen explores not just the relationships between the guardsmice, but i In Winter 1152, David Petersen continues his tale of mouse intrigue, glory, and honour apace. Rather than having the squashed rebellion of Fall 1152 simply fade into memory as a one-off plot to give the first volume some heft, we see that these things have lasting consequences and that the flames that leapt up in open rebellion still smoulder in traitorous saboutage. 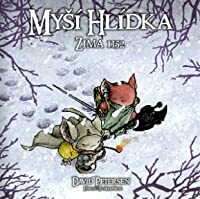 This volumes lays more foundation for upcoming books as Petersen explores not just the relationships between the guardsmice, but investigates the political relationship between the cities between which Gwendolyn's mouseguard plays mediator. Further, it explores the recent history of the war with the weasels of Darkheather and hints at a dark future. It's like an adult Redwall. It's not bad, but there is something about it that leaves me a bit cold. The artwork is wonderful but the Mice Templar is better storywise, I think. As a special reward for May, we bought her the second Mouse Guard. I was a little frustrated to learn a) it hasn't come out in soft-cover yet and b) Volume 3 iss only barely beginning to come out in issues! My daughter is obsessed. She is going to dress as Gwendolyn for Halloween this year. Her drawing quality took a giant leap when she started drawing guardsmice. She writes her own comics (2-3 panels of mice facing off aginst bullfrogs and the like). This volume doesn't have quite the epic-span f As a special reward for May, we bought her the second Mouse Guard. I was a little frustrated to learn a) it hasn't come out in soft-cover yet and b) Volume 3 iss only barely beginning to come out in issues! This volume doesn't have quite the epic-span feel of the first volume, and does well because of it. The characters are more deeply drawn, both in personality and in increasing details in dress and equipment. Occasionally the settings show a bit too much of their inspirational source - I swear one of the backgrounds of the arches in Darkheather is lifted straight from a picture of the graet mosque in Cordoba. Even so, Darkheather is a damned good stand-in for Tolkien's Moria. Se possibile, il secondo volume è ancora più bello del primo. Molto è dovuto sicuramente alla neve, che rende le atmosfere ovattate e misteriose. L'aver separato il party permette di avere una serie di storie parallele che si ricompongono alla fine in maniera - oserei dire - lirica. Da brivido la "sequenza muta" durante cui le didascalie "cantano" la Ballad of the Ivory Lass , di cui consiglio l'ascolto durante la lettura per un'esperienza veramente immersiva. Parádní, grandiózní ujm z brka D. Petersena! Styl jako z Pána prstenů a jednoduše, přesto kouzelně pojatá dějová linka. Radost! Návrat do času dětství je zaručen. Reread this one today. I have mixed feelings. The story was fun and I think the art works perfectly to illustrate this world. But I found the book fitted bogged down with exposition. I really didn't care about the complex relationships and when one character was talking about another character I had very little idea who they were actually talking about (this may be due to Peterson, but I'm willing to accept that I just wasn't paying attention - but out of a lack of interest). The second volume of this series was almost as good as the first. The art is tremendous in this series and the story isn't far behind. I've heard many people say they think this series would be good for younger readers, but really I'm not seeing that. The characters are talking animals, but the language and situations are not aimed at younger readers. Well, maybe YA type readers, but not children. I don't mean the book is loaded with curse words, but it's somewhat old English type dialogue, plus The second volume of this series was almost as good as the first. The art is tremendous in this series and the story isn't far behind. I've heard many people say they think this series would be good for younger readers, but really I'm not seeing that. The characters are talking animals, but the language and situations are not aimed at younger readers. Well, maybe YA type readers, but not children. I don't mean the book is loaded with curse words, but it's somewhat old English type dialogue, plus I think some of the political intrigue would be lost on really young readers. In any case, this is a really cool, epic story. Part of me says if you read it and picture the characters as human you get a more "mature" story, but at the same time that would totally defeat the purpose. My first reaction after finishing this book: "Aw, man...it's over." I was instantly captivated by Mouse Guard: Fall 1152 and had to read the next volume as soon as possible. Being a slow reader, however, and what with it being the holiday season, I didn't read Winter 1152 as quickly as I intended. Personal gripes aside, this volume was every bit as lovely as the first, both plotwise and in illustration. The ending was very touching as well. I believe Mouse Guard can teach readers about the values My first reaction after finishing this book: "Aw, man...it's over." A dark story with exquisite artwork (and the occasional piece of terrible poetry). Mouse Guard never fails to fill me with the warm & cozies. My favourite fireside series. This review has been hidden because it contains spoilers. To view it, click here. Unfortunately, the second volume of Mouse Guard was substantially less enjoyable than the first. Several cliches show up in the plot and characters. The biggest problem is that other than the old mouse, I felt like I barely knew the mice any better by the end of this volume than during the first. I know this book is geared towards kids, but most fantasy books I've read have somewhat flat characters and they still have more depth than the ones here. The second problem is the very cliche and borin Unfortunately, the second volume of Mouse Guard was substantially less enjoyable than the first. Several cliches show up in the plot and characters. The biggest problem is that other than the old mouse, I felt like I barely knew the mice any better by the end of this volume than during the first. I know this book is geared towards kids, but most fantasy books I've read have somewhat flat characters and they still have more depth than the ones here. The second problem is the very cliche and boring love story that appears here. The romance here feels very shallow and completely uninteresting. It is true that males and females who spend enough time together start to get romantically interested, but that alone does not make for an interesting love story. To make matters worse, Mouse Guard commits an even bigger cliche sin. Whenever there is someone old, they have to die to make way for a younger hero. That is exactly what ends up happening here and while the character that dies is cool, it is something that has been done so many times that it has less of an emotional impact than it should. I actually started rolling my eyes as I read, because I could see the death pages before it happened. 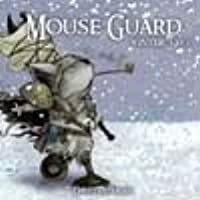 A much more grounded story than the first Mouse Guard volume. Instead of an epic, sweeping tale with no time to develop most of its components, we get a much smaller story of the Guard just trying to make it back to their home with supplies. This makes for a far more enjoyable read, as it doesn't take huge leaps forward in story, instead staying very close to our main heroes as they battle their way back to Lockhaven. That said, I still find the series a little silly at times. 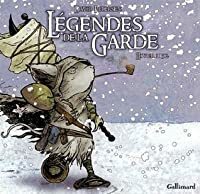 It takes itself so A much more grounded story than the first Mouse Guard volume. Instead of an epic, sweeping tale with no time to develop most of its components, we get a much smaller story of the Guard just trying to make it back to their home with supplies. This makes for a far more enjoyable read, as it doesn't take huge leaps forward in story, instead staying very close to our main heroes as they battle their way back to Lockhaven. That said, I still find the series a little silly at times. It takes itself so deadly serious, which would be fine if there ever felt like there were grander, personal stakes involved. There's a scene where one mouse kisses another mouse out of absolutely nowhere, and we're meant to think of it as a tender moment. I'm sorry, but mice kissing each other looks ridiculous. Also, in one of the more important scenes of mice fighting an owl with swords, I couldn't help but laugh at the visual. It's definitely not intended to be funny, but it just comes across that way, so having these cartoony visuals approached with such a dire tone just takes me out of it a little. As mentioned in my Spring 1152 review, we accidentally read this one first, and it was tougher to comprehend lacking the back story. But this journey story, visiting the Weasely underworld and a nice macabre interaction with bats that for my young darklings was much enjoyed. Speaking of bats, there is sort of a legendary mouse named the Black Axe who your kids will likely love as mine did, but his arc has perhaps a tragic tinge to it, so be forewarned with more sensitive young ones. As this is mi As mentioned in my Spring 1152 review, we accidentally read this one first, and it was tougher to comprehend lacking the back story. But this journey story, visiting the Weasely underworld and a nice macabre interaction with bats that for my young darklings was much enjoyed. Speaking of bats, there is sort of a legendary mouse named the Black Axe who your kids will likely love as mine did, but his arc has perhaps a tragic tinge to it, so be forewarned with more sensitive young ones. As this is mice, and a (nice-looking) graphic novel...the old notion that cartoon "people" are not real people helps with distance over death. Hmmm, Petersen's web site http://www.mouseguard.net/ sites NY Times Best Seller nods, so perhaps this is not quite the rare jewel I had thought. Additionally, I see merchandise and a Role Playing Game...hmmmm. On the bright side, I do see mention of another series, "The Black Axe 1099-1116” prequel beginning in 2010. With supplies depleted as winter approaches, the guardmice send messengers to the nearby towns to request needed supplies and to invite the leaders to a summit to find common solutions to the threats facing the mice. David Petersen envisions a medieval-style society made up of mice and the warrior-mice who serve as their protectors. While one group is split up as they struggle to make it home, treachery lurks in the halls of Lockhaven. This was my first introduction to Mouse Guard, aside from a co With supplies depleted as winter approaches, the guardmice send messengers to the nearby towns to request needed supplies and to invite the leaders to a summit to find common solutions to the threats facing the mice. David Petersen envisions a medieval-style society made up of mice and the warrior-mice who serve as their protectors. This was my first introduction to Mouse Guard, aside from a couple of their FCBD books, and I was very impressed. The fight scenes are harrowing and intense. The characters go through a whole range of interpersonal conflicts even as they loyally fight to save each other and their home. The art is absolutely gorgeous, and the story built to a powerful climax, and followed with an epilogue that left plenty of room for further adventures. Three and a half stars. The illustrations in this sequel are still gorgeous, and after mentioning Dinotopia in my review of the first book, I was tickled to see this Foreword by James Gurney. He writes, "With impeccable taste Petersen chooses dramatic camera angles and striking compositions, not merely to tell the story, but to expand the world. The colors transition from golden firelight to pale blue moonlight." I guarantee the constant snowfall in this book will make you feel cold. However, the Three and a half stars. The illustrations in this sequel are still gorgeous, and after mentioning Dinotopia in my review of the first book, I was tickled to see this Foreword by James Gurney. He writes, "With impeccable taste Petersen chooses dramatic camera angles and striking compositions, not merely to tell the story, but to expand the world. The colors transition from golden firelight to pale blue moonlight." I guarantee the constant snowfall in this book will make you feel cold. However, the text left me a little cold as well. I noticed many editorial mistakes; the print was tiny; I couldn't tell when words were bolded. Jumping from one plotline to the other often confused me, and though the following chapter would begin with a paragraph describing what the reader just saw, I was annoyed that I had to wait for that bit to be sure what happened. Just after reading the first volume (Autumn 1152) I started this one, and I think I liked the story a little bit more. Some scenes are quite fascinating and intense, but a little bit frustrating too, as they references to an era that we will not see and that looked so interesting. I managed to attach myself to some characters in this one and the plot was deeper. I'd love to read a third one if it goes better again. The cinematic paneling and storytelling that started in "Fall" continues here in "Winter" making this a joy to read. I enjoy recharging my batteries between longer novels with graphic novels and this one was perfectly suited to the task. Looking forward to the next installment. These turned out to be very beautiful graphic novels, and scale well to different readers ages. I have trouble distinguishing between the mice. However, I do like Lieam, and thought it was pretty cool when he took up the mantle of the Black Axe. I also think it's a good comic for kids. The artwork is just beautiful and the story is engaging and wonderful. I really hope I can get my hands on the rest of these. The art is amazing and the story is really good, too. "It matters not what you fight but what you fight for"